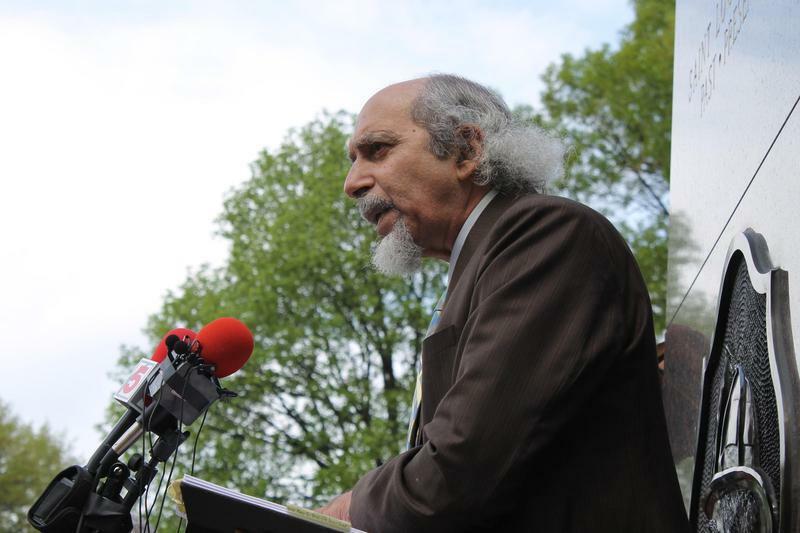 St. Louis Poet Laureate Michael Castro delivers a poem before the ceremonial swearing-in of the St. Louis Board of Aldermen in April 2015. Friends, family and admirers will remember St. Louis poet Michael Castro during a memorial service Sunday at Central Reform Congregation, 5020 Waterman Blvd. Castro died Dec. 23 from colon cancer, at the age of 73. He served just over two years as St. Louis’ first poet laureate. The Board of Aldermen confirmed him to the post just weeks after a grand jury chose not to indict Darren Wilson in the shooting death of Michael Brown in August of that year. Through his poetry, Castro sought to address the racial and socio-economic divisions spotlighted by Ferguson protesters. “Words provide moments of identity with quote-unquote ‘the other,’ moments of simple recognition of our common humanity,” he told St. Louis Public Radio in 2014. Born in New York City, Castro moved to St. Louis and earned a Ph.D. in American Literature from Washington University. His studies in St. Louis focused on Native American mythology and culture. For 32 years, Castro was a professor at Lindenwood University before retiring in 2012. He also taught at the University of Missouri–St. Louis and founded the River Styx poetry group and publication. In a signature poem, “We Need to Talk,” Castro urged all St. Louisans to view each other as simply human. In 2015, Castro described the unrest in Ferguson and its underlying causes as wounds ready for healing. “I think the scab has been lifted and the poison is pouring out and there’s an openness,” Castro said. “There’s a recognition that there has to be a change. Castro will be remembered at gathering Sunday beginning at 3 p.m. Following Castro’s death, poet and educator MK Stallings told the St. Louis American that Castro used poetry to bridge divided communities. “Our hearts break because of what he has meant to the city and the poetry community,” Stallings said. Updated 3:00 p.m., Dec. 28, with "St. Louis on the Air" segment – When Michael Castro spoke in the City Hall Rotunda last month to pass the St. Louis poet laureate torch to his good friend Shirley LeFlore, he beamed. It was clear that cancer was taking its toll on his body, but his spirit seemed defiantly filled with joy. He smiled big, hugged long and was so thrilled it was as if he was getting installed all over again.